The Get Fit initiative was inspired by a well-known person in Kenmore—Anne Vacanti—who was a long time employee of Kenmore’s oldest business, Hofert Jewelers. Anne died from ovarian cancer when she was still a relatively young woman. 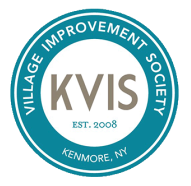 KVIS and Hofert Jewelers joined together to raise awareness and funds to help combat the disease through an very visual event called Kenmore goes Teal. Teal is the designated color of ovarian cancer, like pink is for breast cancer. KVIS members joined together one Spring Saturday morning to literally frost the Village in teal ribbons. The long ribbons were strung from many lamp posts and pretty much every surface that could accept a ribbon. The vision was dramatic and helped draw people into Hofert Jewelers where they could purchase a teal bracelet; all the proceeds from the sale of the bracelets were then donated. Thanks to the generosity of Kenmore area residents, the Teal Village initiative raised $1,500 for cancer research and care; the KVIS raised $500, Hofert Jewelers raised $1,000. The funds raised by the KVIS were donated to Gilda’s Club and the funds raised by Hofert Jewelers were donated to Roswell Park Alliance Foundation. Thanks to the generosity of Kenmore residents, the Teal Village Initiative raised $1,500 for cancer research and care. The funds raised by the KVIS were donated to Gilda’s Club and the funds raised by Hofert Jewelers were donated to Roswell Park Alliance Foundation.